Matthew Bogart is a freelance cartoonist born in 1978 and graduated from the Savannah Collage of Art and Design with a Bachelor of Fine Art in Sequential Art. He lives in Portland, Oregon where he was a co-founder of Couch Gallery. 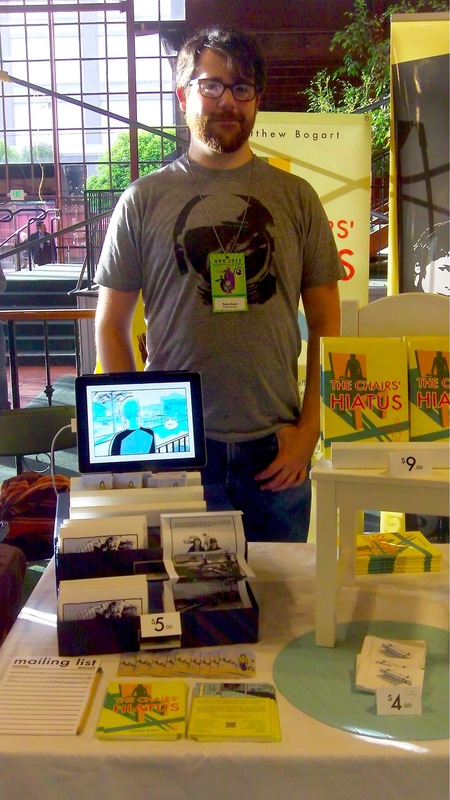 He published his first graphic novel titled "The Chairs' Hiatus" in 2012 and is currently serializing pages of his second book "Oh, It's the End of the World." He was a member of theater troupe "The Grand Deacons of Erin Delaney" , co-funded the flip book printing company "Flipbook Empire" and was a member the band "Cho Young and the Davenports." He also co-wrote the play "Stanley Can't Fly". He is available for freelance comics, design, and illustration work at extremely reasonable rates. Get in contact with him for more. Sign up for occasional updates about new work and events. Some questions I was asked in an email once. So basically, who are you? Where are you from? Where are you living now? How long have you been drawing? How old are you? What tools do you use to draw? Do you use a computer or is everything done on paper? Etc. Originally I'm from a city in central Ohio called Mansfield. It only barely qualifies as a city. I the tallest building clocked in at five stories tall. I started drawing comics in the mid 90s in Mansfield. They were terrible superhero comics that I would photo copy at my dads office and sell at the local comics shop. After graduating from high school I went to college for "Sequential Art" (comics) in Georgia. While there I did a lot of theater, and played in a band called "Cho Young and the Davenports". We were a big crazy goofball of a band with 10 members. After school ended 10 of us from collage moved up to Portland Oregon where I've lived ever since. I took a 9 year break from drawing comics after I got out of school. The Chairs' Hiatus was my attempt to get back on the horse. I switched to drawing digitally right before starting that project and I've never gone back. I've drawn one page on paper in the last 13 years. I love it! Oh, and I'm in my mid 30s. I have three books text to my drawing table at home that I turn to for inspiration: Lost Cat by Jason, Scott Pilgrim Color Volume 1: Precious Little Life by Bryan Lee OMalley, and Stray Bullets. Volume One: Innocence of Nihilism by David Lapham. I'm also a big fan of Chris Ware, Sam Alden, Jeffery Brown, David Mazzucchelli, and James Kochalka. I like John Ronson, Michael Chabon, Matt Fraction, Chuck Klosterman, Ryan North, and most of the artists listed above count as writers that influenced me greatly as well.